The reality is that treating everyone the same can be one of the most unfair things you do as a leader. It’s easy to fall into the trap of treating everyone the same because it’s the easiest thing to do. Broad-brushing everyone with the same treatment is less work and causes fewer headaches for leaders. “Sorry, that’s the policy” or “I’m treating you the same way I treat everyone else” takes less mental and emotional effort than digging into the individual situations of our team members and formulating an appropriate response. Frankly speaking, I think it’s a leadership cop-out to treat everyone the same. It’s the path of least resistance. Now granted, there are certain rules or policies, particularly those involving health, safety, and welfare, that need to apply to everyone equally. But generally speaking, when it comes to day-to-day employee relations, too many managers default to treating everyone the same as their method to ensure fairness. Instead of trying to be fair by treating everyone the same, try treating people equitably and ethically given the particular situation. Let’s drill into that a bit more. Treating people equitably means being impartial, unbiased, and even-handed in your dealings with others. It also means you are concerned with people getting their just deserts; what they have rightfully earned or deserve. Treating people ethically means you hold them, and yourself, to the principles, standards, rules, or policies of right conduct. Let me give you an example. My team has a policy that affords people the privilege to work from home two days a week if they meet specific standards of performance. Some people meet the standards and get to work from home while others don’t meet the standard and aren’t able to enjoy that privilege. Both sets of people are treated equitably because the policy is applied impartially and they receive what they deserve. They’re also treated ethically because they are being held to the same standard of performance. If everyone were treated “the same,” it would mean all or nothing—either no one is allowed to work from home or everyone is given the privilege. You can see why it would be easier to treat everyone the same instead of looking at each case individually and treating the person equitably and ethically given his/her unique situation. Treating people equitably and ethically is closely tied to the concept of justice. 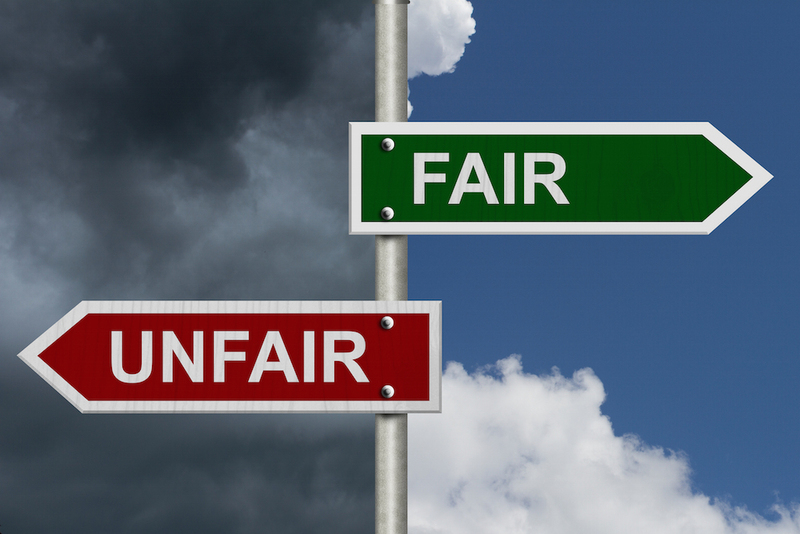 Fairness and justice are often used interchangeably but they are separate constructs. (See here, here, and here for interesting reading on the distinctions between fairness and justice.) Without getting too far down a rabbit’s hole, there are two forms of justice leaders should pay attention to: distributive justice and procedural justice. Distributive justice is concerned with the fair distribution of pay, rewards, and recognition within the organization. Procedural justice involves the policies and procedures of an organization being applied fairly and consistently across the organization. Treating people equitably supports distributive justice in that people are rewarded according to what they’ve earned, whereas treating people ethically supports procedural justice because everyone is held to the same standard and must play by the same rules. Treating people fairly can feel like a no-win situation for leaders. There will always be someone who exclaims “that’s not fair!” which causes leaders to play to the lowest common denominator—treating everyone the same. As the quote above from Aristotle illustrates, not everyone is the same, and treating them the same can be one of the most unfair things you do. Instead, focus on treating people equitably and ethically. It takes more time and effort, but in the long run you will be known as a fair and trustworthy leader. What do I think… I think people need to be fired and their terrible two’s shown the door. “That’s not fair!”. How’s this for fair? You’re fired. To tolerate this terrible two’s is to destroy the morale of people who are on a team to perform with excellence and reap the rewards thereof in true equity. The whiners and the complainers… have to go. And if anyone says that this does not build trust… it sure does. Because the people there to work, achieve, and gain the rewards of their labor don’t need the whiners dragging the whole team down with them. That’s my thought. And I work with volunteers… and fired 2 of them this week. Why? They wanted personal attention. I didn’t bring them on board to babysit them. I brought them on board to do the work. 🙂 **I was always the captains of my teams selected by my peers. Either you want to win or you don’t. That’s what I think. Thanks for adding your thoughts Laura. I’m eager to hear what others have to say. Great article Randy. I try to inform my managers not to treat everyone the same, but treating people the same is drilled into their heads because of fairness, including many HR professionals. I’m going to share this article with my management team! That’s great Jan! I’m glad you found the article helpful. Thanks for the feedback Emmanuel. Have a great day. A spot-on post Randy! So many people water down principles when trying to execute fairness. Realizing ethical balance is the ultimate key in leadership. Too many people dilute standards in making things fair, and miss an incredible opportunity for developing their folks. Brilliant post! Thank you Paul, I appreciate your feedback. Yes Randy, well put. I really like the distinction you make between equitable and equal but always ethical. What fascinates me though is when coaching sport teams we sometimes take a different approach. For example I coach my son’s football team and we take the approach in practice the whole team pays for an individuals lack of effort and/or focus. I guess the idea with this is to improve being accountable to your teammates. More from a curious point of view with your example about working from home, I’m wondering what would happen if someone wasn’t meeting the set-out standards of performance, the whole team couldn’t work from home? I think we know the cons and the fall out that would happen in taking this approach but based on your experience and training are there any benefits to this approach in the work environment? Thanks for the feedback Murray! I appreciate your readership. You pose a good question. I’ve used that same tactic myself in coaching sports teams. If one player doesn’t pull his weight, then all the others pay some sort of consequence. It’s obvious we’re trying to create a culture of accountability to your teammates as well developing a team mindset. In terms of how that could or does apply at work, I think we have to first acknowledge some key distinctions. The first, of course, is that we’re dealing with kids/teenagers and not mature adults. Second, the kids are playing a game and we’re explicitly there as coaches to help them learn not just the game but the value of teamwork, sportsmanship, etc. Our employees at work are being paid to perform some type of service or provide a contribution of some sort. There is a much greater focus on individual responsibility in the workplace (and hopefully our employees have learned well from their time in youth sports/activities!). I think there are appropriate situations at work where the team earns a reward if everyone does their part, but I would be leery about punishing an entire team for the failures of one individual. That’s good food for thought! Great points Brad. Thanks for adding your insights to the discussion. I read your blog for the first time today, and I thought this was a wonderfully communicated thought. Often times, I get stuck behind company policies that suggest that every time I take an action with one employee, it has to be applied the same to every one else. That could easily be implied, like in your example, that we should be practicing procedural justice (to avoid lawsuits). However, distributive justice should always be considered except in areas where there is no wiggle roo. People who perform should be given the opportunities they’ve earned. I appreciate your time reading my comment. P.S. I will be reading often now! I know from experience that sometimes being “fair” feels like a lose-lose proposition. I’m glad you found the article helpful.